Posted by Ada Wang on 10/17/2018 11:23:24 AM. Many people like watching videos on YouTube or Facebook. However, Kindle Fire 2 and Kindle Fire HD (7" and 9") do not come with a built-in Flash player since Adobe discontinued the support of Flash Player last August. This post will show you how to install and enable Flash Player on Kindle Fire tablets. For owners of the first generation of Kindle Fire (released in 2011), simply tap "Web" on the top navigation bar to launch the browser, tap the menu (or options) icon at the bottom, then "Settings", scroll down to "Enable Flash" and choose "Always on". Relaunch your browser and you will be able to play video on your Kindle Fire. For owners of Kindle Fire 2 and Kindle Fire HD, things are a bit complicated, as there is even no "Flash Player" setting on the device. In this case, you can follow steps below. Step-by-step to install Flash Player on your Kindle Fire (HD). 2. Kindle Fire Flash Player. Since Kindle Fire's built-in silk browser does not support Flash Player by default, we will have to use external Dolphon browser instead. 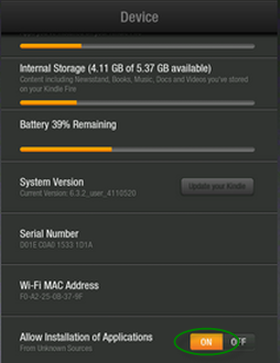 Step1 Enable application installation from unknown sources on Kindle Fire. 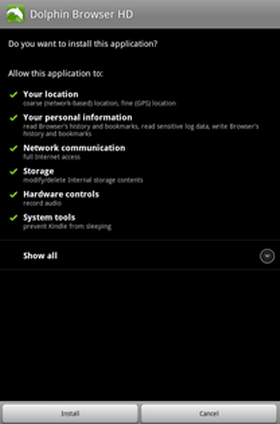 Tap the top right corner on the screen to choose "More" -> "Device", then turn on "Allow Installation of Applications". Step2 Install Dolphin Browser and Kindle Fire Flash Player on your Kindle Fire. Launch the built-in browser on your Kindle Fire, input the following string bit.ly/N0tGoL on the browser (case sensitive), Dolphin Browser APK (installation file) will be downloaded to your Kindle Fire. When the downloading is done, there will be a "Download done" notification on the top of the screen. Tap to install Dolphin Browser on your Kindle Fire. The file name is "Dolphin_Browser_HD_8.5.1.apk". This is similar to the installation of Dolphin Browser. Type in the following URL d-h.st/x4v on the browser, tap the black download button under the image to download the Flash Player app. When the downloading is over, tap to install. The file name is "install_flash_player_ics (1).apk". Step3 Launch Dolphin Browser on your Kindle Fire. Go back to the home screen. 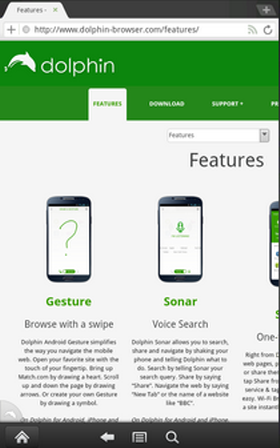 Navigate to "Apps" and select "Device" to launch Dolphin Browser. 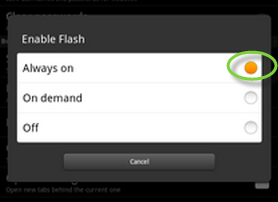 Tap "Start now" -> "Accept" -> "Always on" (Flash Support) and "Desktop" (Perform as) -> "Next" -> "Skip" -> "Finish". 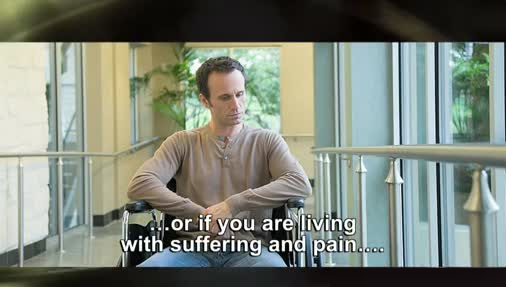 Go to a video site and check. This guide is written for Kindle Fire users or lovers. A cool trick for you. We also gathered top 10 kindle fire cool tricks, see the full list? Hi when opening the downloaded dolphin installation file, I am told the format is not supported. tips? As long as the given link is launched, the file will be downloaded. The correct file name of dolphin installation is "Dolphin_Browser_HD_8.5.1.apk". Make sure the file is fully downloaded. 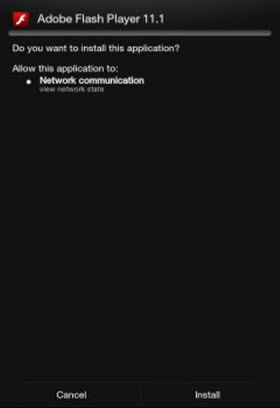 Dolphin browser keep crashing every time i'm trying to use it on my Kindle Fire. How can I get a flash player and an istruction book? What are the exact steps needed to do Step 2? Step2: Install Dolphin Browser and Kindle Fire Flash Player on your Kindle Fire. The instructions were fantastic. You are the best for writing the instructions. They were easy to set-up flash player on my Kindle. I used them with success. I usually go to YouTube but this was much quicker and you can save them. Hooray!!!! !I thank you again. May you be blessed. the flash player link is invalid. It brings up many music file upload sites but nothing about flashplayer. It does not even come up as a black screen. Thank you, thank you, thank you!! So easy ... much better than other complicated advise I'd been wading through. Just FYI had to install ES File Explorer before I could open and install the dolphin and flash player files, but none the less so simple and easy. Thanks again!! The instructions are perfect. And the Dolphin browser and flash player work excellently on the Kindle Fire HD. Hi, your instructions were good but when the download said it was done, I went to click on it only to find that it had gone and all I got was no nothing but time wasted. So what do I do because it isn't showing up anywhere not even on the apps page on the Kindle Fire 7". Instructions worked flawlessly the first time around. Silk either does not like the links or the sites are having intermittent problems. SOLUTION: we are going to manually "Side-load" the files. Step 1: Download both files with your desktop or laptop computer. If you get a dialog box, SAVE the file. Step 2: Connect your Kindle Fire to your computer. Step 3: Move both the Dolphin browser and the flash browser files to your Kindle. I suggest the "Downloads" folder for a location. Those are the two files you just downloaded that end in ".apk". If you have "hide file extensions" on your computer, look for the file names themselves. DO NOT MOVE, DELETE, OR RENAME ANY OTHER FILES ON YOUR KINDLE WHILE DOING THIS! Step 4: Browse to the "Downloads" folder or wherever you moved the two .apk files and install the Dolphin browser FIRST*. Do not open it yet. Install the Flash player. Do not open THAT either. Step 5: Open Dolphin explorer and skip through the first few pages. Open any major video-sharing site as a test (like Youtube or Vimeo) and see if it works. *IMPORTANT: --If you do not have the program "ES File Explorer"---, you will need to install that FIRST (or an equivalent program) so you can browse on your Kindle like you can on your computer to any folder you want. Otherwise you're stuck with the Kindle's graphical interface. If you are uncomfortable 'browsing' your kindle or have never done it before, ask a tech-savvy person. Thank you so much for the detailed step-by-step. I really needed that much help. It was perfect! Videos play on my Kindle HD like a dream and I am happy. Now I can play my games on Facebook when I'm away from home. Thank you, thank you, thank you! I can't say it enough! Dolphin is saying it can't load plugin. What to do? Download was successful but I still cannot open the tv show I want. This no longer works. I think Amazon is actively defeating workaround towards flash on the kindle fire as quickly as they are conceived.